Download Ghost Rider in Digital HD from the iTunes store. 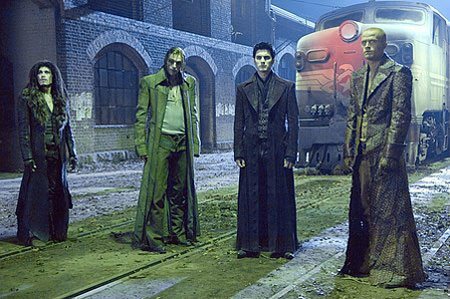 Ghost Rider images are © Columbia Pictures. All Rights Reserved. It's the start of a new year, and the start of a new comic book movie season. 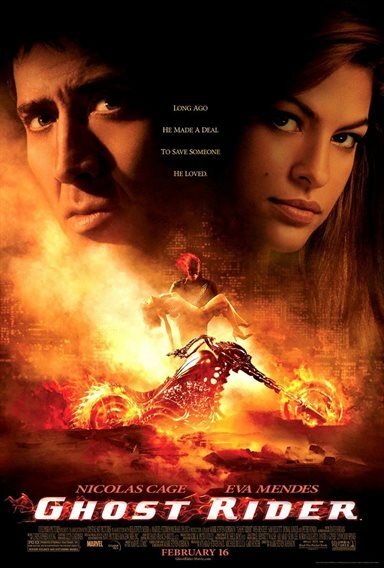 This year director and screenwriter, Mark Steven Johnson, kicks it off with Ghost Rider starring Nicolas Cage as the title character, Eva Mendes, Peter Fonda, Donald Logue (Blade), and Wes Bentley. 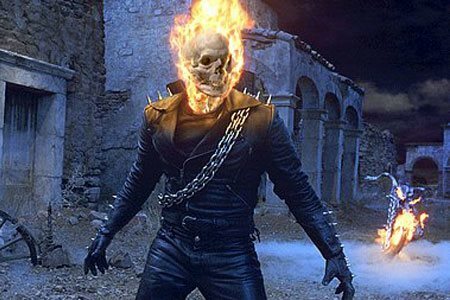 Unfortunately, this year's season of comic book movies fizzles on ignition with Ghost Rider. Ghost Rider follows the story of Johnny Blaze (Cage) who, as a child, makes a deal with the devil to save his father's life. In return, the devil (Mephistopheles) will call upon Johnny Blaze later on in life to be the Ghost Rider (his bounty hunter). The story of Ghost Rider is not a new one and is based on the Marvel comic book hero of the same name. However, what works on the page does not necessarily transform well onto the silver screen. Most comic book movies today fall into two categories. The films that take themselves seriously or the films that try to be more of a direct translation and fail. Ghost Rider unfortunately took the second road and was a poor choice indeed. Mark Steven Johnson, the director and screenwriter of this movie, is no stranger to comic book movies. In fact he is the creative talent behind the 2003 smash hit, Daredevil, starring Ben Affleck, Jennifer Garner, and Collin Farrell. Unlike his first outing, Mr. Johnson goes for a more direct comic book translation with all the cheesy lines, one dimensional wooden character and clichés to boot. Throw in a bunch of horrible CGI effects and you have the main elements of Ghost Rider. 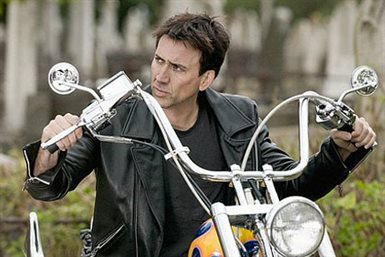 The only shining star in the motorcycle wreck of a movie is Nicolas Cage. Were it not for his presence, Ghost Rider would be an unbearable movie to watch. Mr. Cage's tries to flesh out the character of Johnny Blaze and give the movie substance, but can only work with what is given. 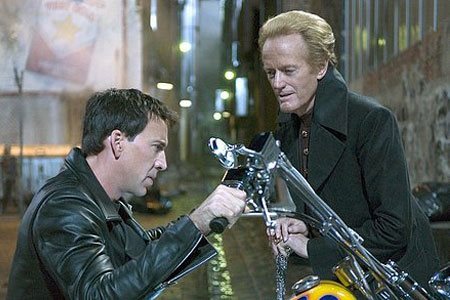 If you are a fan of the comic book, campy comic book adaptations, or just want some mindless fun, Ghost Rider might be for you, but with such great comic book adaptations as X-Men, Batman Begins, Superman Returns, and Blade out there, I just seem this one as buried on arrival. 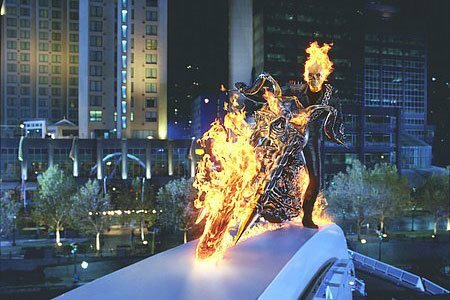 Ghost Rider images © Columbia Pictures. All Rights Reserved.